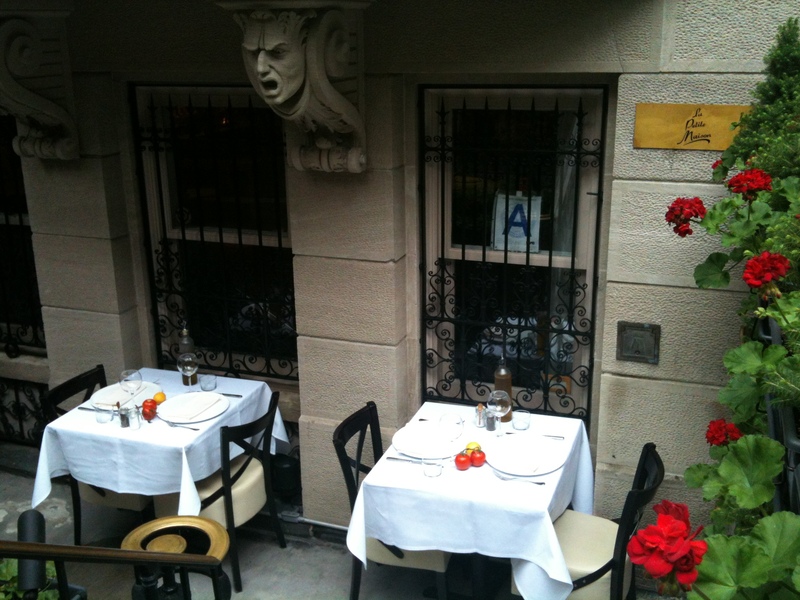 The other day I lunched at La Petite Maison, an upscale restaurant located at 13 W. 54th Street, the house to which the newly wed Mr. and Mrs. John D. Rockefeller Jr. moved in 1901. It was here that his wife, Abby Aldrich, gave birth to five of their six children. Thereafter the couple moved across the street to a nine-story brownstone designed by William Welles Bosworth. This house, located at 12 W. 54th Street, as well as that of John D. Rockefeller, Sr. at 4 W. 54th Street, no longer exists, but the block is still reminiscent of the family’s sixty-years-long tenancy. Much of the south side of block is now occupied by the Museum of Modern Art, which much to her husband’s consternation, Abby and her friends founded in 1929. The museum, referred to in the family as “Mother’s Museum,” moved to 53rd Street in 1939, and 97-year-old David Rockefeller is still its Chairman Emeritus. The Rockefellers had also bought up property on the north side of 54th Street. During the 1930s, Nelson Rockefeller and his favorite architect Wallace K. Harrison built the striking Rockefeller Apartments at 17 W. 54th Street. In 1957, Nelson opened the nascent Museum of Primitive Art—now part of the Metropolitan Museum of Art—at 15 W 54th Street. 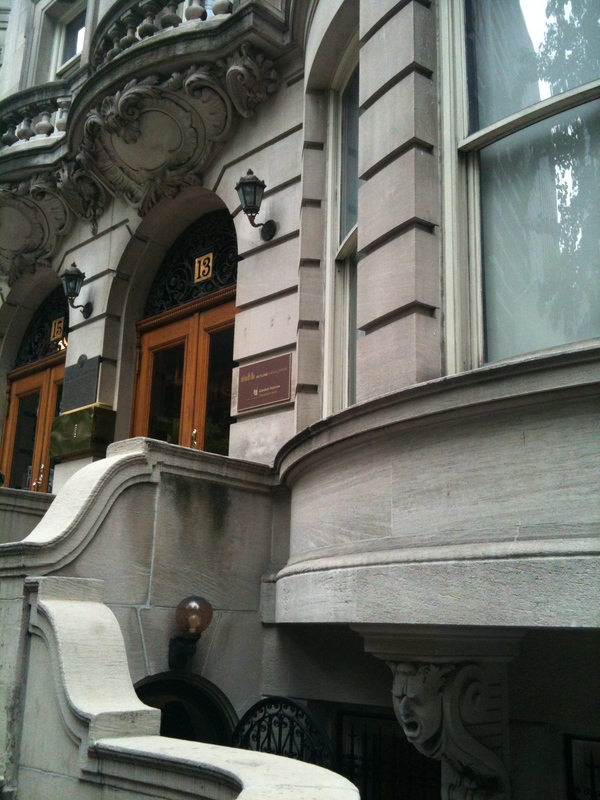 A historical plaque on 13-15 W. 54th Street informs us that Henry J. Hardenbergh, best remembered for his historical Dakota apartment house and the Plaza Hotel, designed the houses in 1896-1897. At that time there was a concerted and successful effort to turn the area into an upscale residential neighborhood. Indeed the Vanderbilts, in their fancy mansions, lived just around the corner. I did enjoy my lunch at La Petite Maison, which has other outposts in Nice, Cannes, London and Dubai. The greens of my caesar salad and its croutons were crisp, the slivers of Gruyere fresh. The pan-seared calamari was soft and not overcooked; the tomato sauce they were served in added just the right tang. The flan was as creamy and sumptuous as flan should be. Naomi, my granddaughter and restaurant-exploring pal, had mushroom risotto and tiramisu. She said that the risotto was as good as the one I make. Since it is one of my signature dishes, her judgment represents an accolade. The tiramisu was excellent. Even though there is no physical resemblance between the Rockefeller kitchen that must have occupied this below-street-level space a hundred years ago and the sleek bar and festively set tables of La Petite Maison, I was content. The perfect fresh tomatoes and lemons that decorate the little tables were unusual, as was the bread served in brown paper bags. I basked in the historical atmosphere of my hometown, which constantly renews itself. This entry was posted in Uncategorized and tagged abby aldrich rockefeller, art, art museums, henry j. hardenbergh, john d. rockefeller jr, la petite maison, lunch in nyc, midtown, moma, nelson rockefeller, new york, new york city, restaurant reviews, restaurants, rockefellers, w. 54th st. Bookmark the permalink.